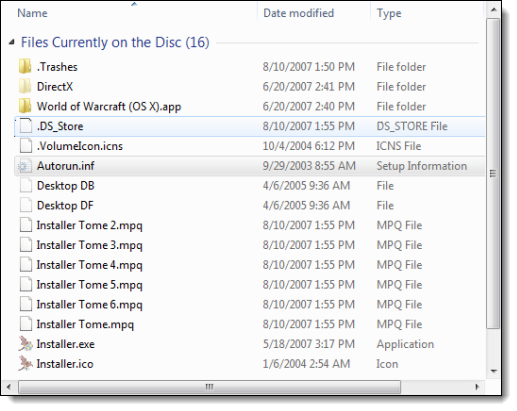 I'll use my original copy of World of Warcraft, a computer game distributed on DVD, as an example here. When I insert The WoW DVD into my machine nothing happens. That's on purpose because I have auto run (also termed auto-play) turned off. Any disk or USB device that would otherwise auto-run will appear in Windows Explorer as another disk drive. Here my DVD player is drive E:, and you can see that the World of Warcraft disk is inserted. As you can see there are two options of interest: "Install or run program from your media", which is bolded to show that it's the default action should you double-click on the drive's icon to run it, and "Open Autoplay...". That default action, nine times out of ten, is probably what you want. Just double click on the drive icon and what use to happen automatically should happen at your direction. Just make sure that it's a disc you know and who's contents you trust. Windows explorer shows what program it would run to "Install or run" - something called "Installer.exe" that's on the DVD. Or you can view the contents of the media. As you can see "Installer.exe" is there, along with assorted support files that presumably contain the application to be installed. There you can see that the instructions for autorun are to run the program "Installer.exe" when the disc is inserted. If autorun is disabled, then that's the program Windows Explorer will have listed when we right click on the icon, or run had we double-clicked on it. Another approach - and to be honest, the approach that I use - is to ignore all this autoplay stuff, and just use Windows Explorer. Simply look at what's on the disc and act accordingly. Insert the disc, open the drive in Windows Explorer and then run the program you want to run (perhaps an installation program, as we saw in the example above), open the files you want to open (maybe it's a CD full of pictures or documents), or copy the data I want to copy (in the case of a disc of data that you want to copy to your machine). Yes, it's a little less convenient, and it does require that you more-or-less know what's on the disc and what to do with it. And, to be honest, that knowledge is useful in identifying things you don't want - like malware. This is kind of a special case, but it's an important one as it's perhaps a common case that can be handled very easily. Let's say you receive a CD full of photos. Skip Windows Explorer, and skip browsing the disc with it. Instead, open your image viewing program, and use its built-in browse or file open functionality to view the contents of the disc. For example I have a shortcut to the FastStone Image Viewer on my start menu - when I get a CD full of images I start FastStone, and use its browsing function to open the CD and browse its contents. Photos are just one example - music, documents, videos all fall into this category. Rather than opening the document to start the associated program, run the program and then choose the documents to open. All of which completely bypasses autorun - enabled or not. Is autorun really that evil, and if so, how do I turn autorun off? Autorun is an increasingly used attack vector for malware. Common techniques to turn it off are incomplete. I'll show you how to turn it off, and recommend you do so. How do I *really* disable auto-play in Windows XP? Auto-play can be a convenient feature but if it's not what you want, it can be difficult to turn off and keep off. The TweakUI utility can fix that. It should be noted that auto-run is a completely different and distinct beast from auto-play, and these should not be confused. Could you please educate us poor users, Leo, on the difference between the two, and on how to enable/disable each one (in all systems, of course, but especially in XP Pro, which just so happens to be the particular system I use)? Isn't this one of the problems with the Sony Extended Play? With autorun, it would install itself on the computer even before you accepted the EULA and it would break things if you tried to remove it. I just read your article "Why does nothing happen when I insert a disc?" Our other computer opens this disc and allows the installation program to install; my computer does not. I cannot see any information on it. I do not understand how to RUN AUTOPLAY AUTOMATICALLY or go into Windows Explorer to see what your article shows as an example. Am I doing something wrong or is there something goofy with the D or E drive? @ Liisa -- just double-click "My Computer" or "Computer" (which should be on the desktop. If not check the Start Menu) and the drives should be in there. I have auto run disabled on everthing possible. My computer is my tool/plaything and I do anything I can to make it do stuff MY way. I might be social networking and I want to play some music but I don't want anything to happen right off the bat. I'll start whatever I can control when I want it started. I don't know if an "e system computer" is the same thing as an "eMachines" computer, but if it is, there's a GOOD chance that the drive itself is dead. Without going into a tirade (as I often do when this brand is mentioned), you might want to check to make sure that you don't have a hardware issue. My wife's Dell Inspiron will not read CD's or DVD's because there is an exclamation point in Device Manager...uninstalling the driver, then rebooting to reinstall does not work. I did a System Restore back more than 3 months...same problem existed. I have created a shortcut to each drive and placed in my Quick Launch toolbar. After inserting a disk a right click on the icon will display a menu with all options. ie AutoPlay, Open, Eject, etc. Hello Leo, it has been long time, hop you doing well and lots of people are getting benefit from you distinguish service. hello,leo- when i insert a dvd in my dvd rom it showes nothing and its free space is-0 and used space is 0 it will say what happend but i see my dvd in my hand that its is writted. I put a dvd in my desktop and it does not recognise it. It asks my to "insert dvd." what do I need to do to get it to work? I've used some of these discs before with no problem.